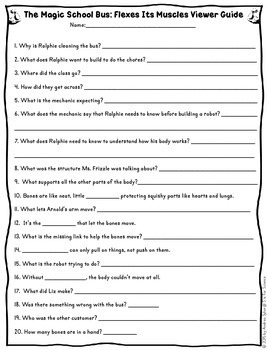 This Viewer Guide contains 20 questions to keep your students engaged in the science of the show. This is a great way to learn about how bones and muscles support the body. With these episodes readily available on the internet, this can even be assigned as homework. These are also great when you have a substitute! Save a BUNDLE on a bundle! 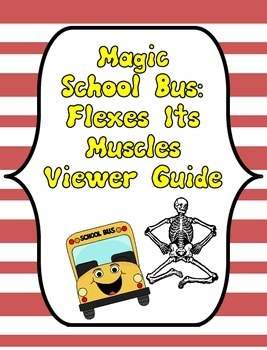 This Magic School Bus Viewer Guide is part of my Magic School Bus Bundle. Check out the bundle to see the other Magic School Bus Viewer Guides I offer that can be purchased individually. All new products are 20% off for the first 24 hours after they are posted! Be the first to learn about new products and sales. Just click the green “Follow Me” star under S is for Science. Be sure to earn your TpT credits! These credits are just like cash! Come back to this page after your purchase to leave a review. It would be much appreciated! Copyright © S is for Science. All rights reserved by author. This product is to be used by the original downloader only. Copying for more than one teacher, classroom, department, school, or school system is prohibited. This product may not be distributed or displayed digitally for public view. Failure to comply is a copyright infringement and a violation of the Digital Millennium Copyright Act (DMCA). Clipart and elements found in this PDF are copyrighted and cannot be extracted and used outside of this file without permission or license. Intended for classroom and personal use ONLY. See product file for clip art credits.